People with allergies and sensitivities to harsh cleaners should try Kaboom Shower, Tub, and Tile cleaner. It offers good cleaning ability without the need to wear protective masks and clothing. It works well on almost all of the surfaces of your bathroom making it a convenient cleaner. The foaming action is powerful enough for moderately dirty bathrooms and perfect for maintenance. Overall Kaboom packs a powerful punch without being as harsh on your skin and breathing. Foaming action clings to surfaces loosening dirt. Can be used for multiple surfaces in the bathroom. Really dirty surfaces may need a harsher product, or more elbow grease with this one, or more time for the foam to sit and work on surfaces. No bleach, which could make a mold and/or mildew removal more difficult. Test in a hidden spot first. After applying to surface, or to sponge, allow sitting for 2-3 minutes. Wipe and rinse thoroughly. Don't allow it to dry on the surface. Having to purchase separate cleaners for the shower, bathtub, floor, and sink never made sense to me. 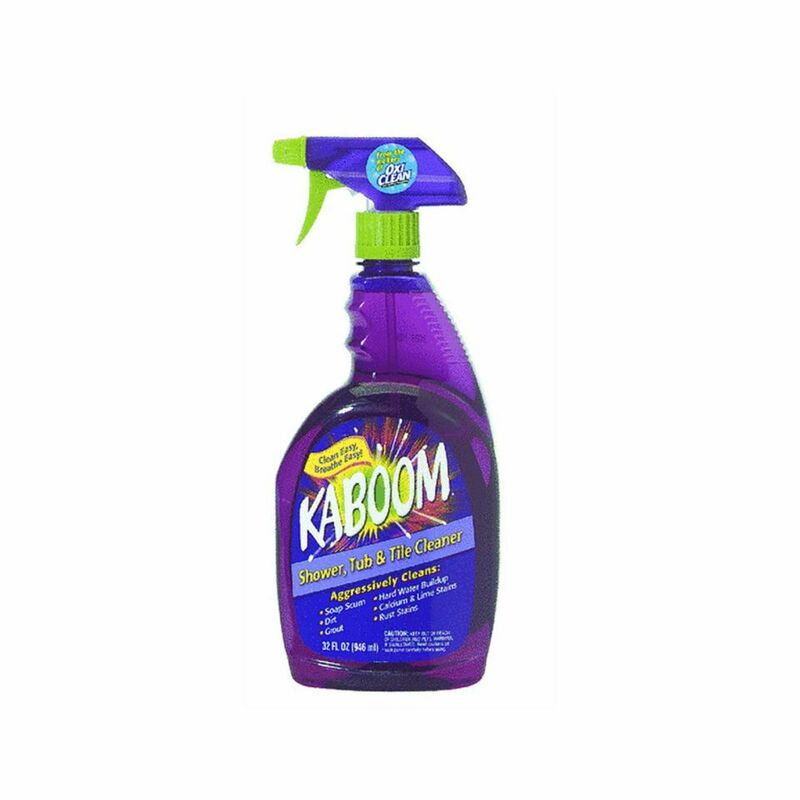 Kaboom is meant to be more of an all-in-one bathroom cleaner. The foaming action is really great with Kaboom Shower, Tub, and Tile cleaner. Remember though that this cleaner works on your tub, shower, doors, sink, tile, and more. It cleans nicely without being harsh on you, your lungs or your skin. Normally when I clean a bathroom, I leave a window open and a fan pulling air to ventilate to make sure I can breathe and see while I'm cleaning. Even without my standard ventilation, Kaboom Shower, Tub, and Tile cleaner didn't make me cough, cause my eyes to tear up, or make my skin feel irritated. My 5-year-old daughter normally runs to another room to avoid the smell when I clean the bathroom, but her only comment was, "Hey. It doesn't smell thick." And the shine I was able to get on the surfaces in my bathroom was really nice. Grime and soap scum were wiped away after letting the thick foam sit on the surface for only a few minutes. I was impressed by how well and quickly it cleaned through tough messes in the bathroom. I think this cleaner is a great option for those seeking for a multi-purpose bathroom cleaner that isn't as harsh smelling as many others on the market. It's a nice product with a nice smell that does an amazing job on the surfaces it cleans. I would recommend this to anyone looking to streamline their bathroom cleaning. Does the Easy-Off Fume Free Max Oven Cleaner Live up to Its Name?